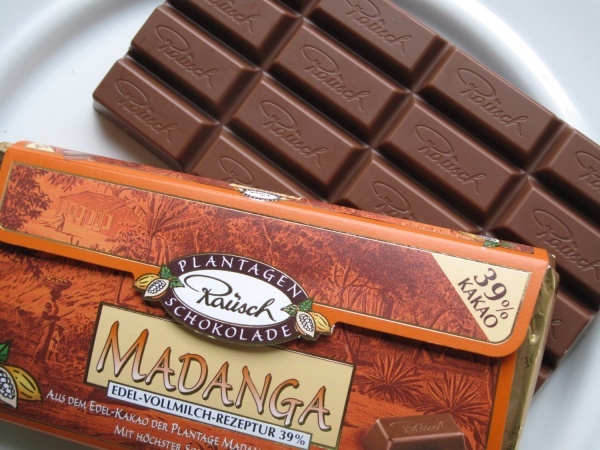 Madanga is a chocolade brand with 39% cocoa from Madagascar and is one of several chocolates in the “Plantagen” series made by the Rausch chocolate company in Germany. While the marketing of the Madanga chocolate has been used in a context of advertising chocolate made from a single source plantation in Madagascar named Madanga, this was fictional marketing. Madanga is the name of a project that supports, together with Rausch and the Malagasy Government, a farmers cooperative made up of several individual farmers, i.e. not one single plantation named Madanga. Rausch confirmed to German media in November 2012 that the cocoa produced as part of the Madanga project does not fully meet the demand for the Madanga production (see Chclt.net blog 30 Nov 2012). However, all cocoa used in Rausch's Madanga product line has been confirmed by Rausch to originate from Madagascar. Additional information about the Madanga project on Rausch's homepage can be found at rausch-schokolade.com/plantagenschokolade/madanga.html. Chclt.net Rausch corrects packaging (20 Dec 2012). Chclt.net Rausch responds to the allegations that the use of the term "Plantation chocolate" is incorrect (30 Nov 2012). Chclt.net continues a blog on the subject of Rausch's doubtful labelling (27 Nov 2012). Die Welt article on book launch of "Der Schokoladentester" in which the author Georg Bernardini brings up the fact of the non-existent "Madanga Plantation" used in Rausch's marketing (27 Nov 2012). This page was last modified on 1 January 2013, at 14:35.